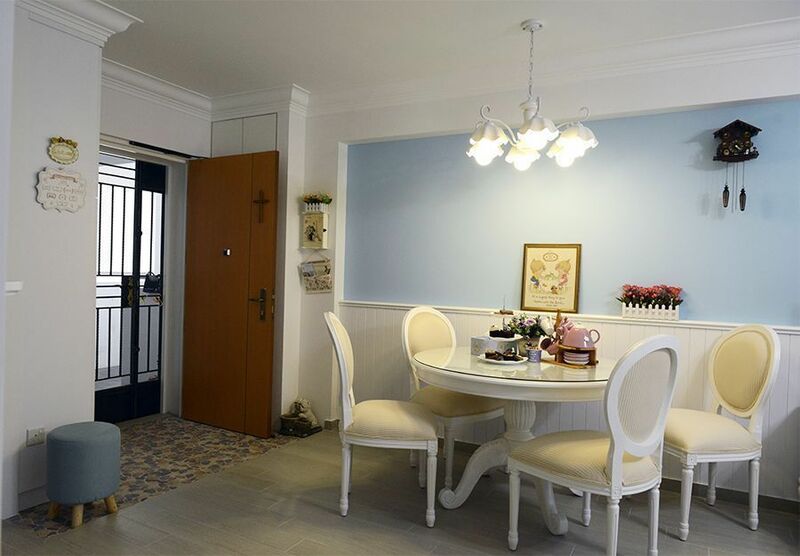 The beauty is in the details in this French country-style HDB flat. Every corner is just too pretty for words! "Both of us designed our place!" beam Paul and Gloria, homeowners of a 92-square-metre HDB flat in Punggol. "Most credits go to the wife but the hubby has been most helpful to help me [interpret] my vast ideas, before deciding how each nook and corner of the house should be designed and decorated," adds Gloria. Country style, the couple's chosen theme, stands out in a sea of Scandinavian and contemporary homes in Singapore. Paul and Gloria wanted their first conjugal home to "ooze warmth, cosiness, and most importantly, a personal touch that portrays our characters and personalities." Hence, their French maison de style campagnard is teeming with postcard-pretty and Instagram-worthy details. "I really made an effort to research because country-style homes are all about decorations. The beauty is in the little things and details," says Gloria. Paul and Gloria left no stone unturned when they had committed to the country interior theme. The experience begins right at the front door, where these details greet every guest. "We used a different tile—the pebbled design—to distinguish the entryway from the rest of the living hall," says Gloria. On their "porch" are the corner wall featuring the pretty key box and mail holder, and the full-height shoe cabinet with beadboard accent and pastel doorknobs. A beadboard wainscoting (wooden panelling that lines the lower part of the walls) is one of the features of this area. It runs from the dining room near the front door to the back of the television in the living hall. "The wall above the wainscoting is painted in Tiffany & Co.-inspired Duck Egg colour. The same colour palette is seen in some of the areas and decors in our house." On the other side of the living room wall is a cottage window with tempered glass. Framed with a white wooden border, this serves as Paul's window from his "man cave" where he works out. On the living hall is the French-inspired buffet cabinet that houses Gloria's collection of Precious Moments figurines and other presents given by Paul. Paul and Gloria carefully selected home decors that would support the theme, like this candy pink rotary phone that exudes a laidback and retro-chic appeal. Paul and Gloria's home is undoubtedly a country beauty. But it's the dining room that promises you a taste of countryside living. The hanging light provides a soft glow while pretty porcelain and ceramic dinnerware lend the country charm to the round dining space—perfect for intimate afternoon teas. Another lovely addition is the cuckoo clock, which the couple bought from Germany. What's a country home without a romantic fireplace? Paul and Gloria improvised and created a fireplace mantel and put two vases of handmade roses—Paul's gifts to Gloria during the engagement and marriage preparation—under it. "The design of our rustic kitchen's cabinet doors are shaker style with a beadboard accent. We chose Eden Blue for the cabinets' colour and white solid surface countertop. The kitchen is adorned with country-designed paintings, clock, and other kitchenware and accessories to complement the country-themed cabinets. Our service yard is painted in bright yellow to enhance the blue country kitchen we have," explains Gloria. The hallway to the bedrooms serves as a photo gallery of the couple. The frames were DIY projects lovingly made by Paul. The master bedroom's wallpaper (backdrop to the king-sized bed) and Angel Pink-hued ceiling hints at classic Victorian flair. Gloria shares more details about their too-pretty bedroom: "Two important ornament pieces, which we recycled from our wedding decor, are the highlights of this room. First is a birdcage lamp, which used to be an Angbao box in our wedding but was transformed into a lamp at the entrance of the bedroom. Another is a hand-painted, wooden-carved mirror frame with our names hand-drawn onto the chalkboard display. It's a wedding gift. Both pieces can be seen from the passageway, providing a glimpse of our Victorian-themed master bedroom." "We sealed up the original door opening to the second bedroom and hack a walk-through from the master bedroom into the walk-in wardrobe. It consists of an entire wall-length wardrobe, a dresser and Gloria's writing desk. The opposite wall is laid with floral-printed wallpaper while the ceiling is painted with Nippon's Indigo Mist to match the wallpaper design and room's theme," Paul says. It was never difficult to convince Paul to go for a country-style home—his only request was to have a space of his own. The compromise was a brilliant idea as Paul's collection would not fit the country-themed living room. The "man cave" houses an Aibi exercise machine, a bookshelf, and his collection of toys and posters including the Avengers movie poster in an LED-lighted frame. The bathrooms also sport dainty details that reflect Paul and Gloria's country theme. No bath is ever boring with little touches here and there. 1. Don't be afraid to explore and try your hand at designing your own home. "After all, we are the ones living in the house day in, day out. If you are able to DIY your own furnishings and décor, you bring more personal touch to your home." 2. Save your furnishings and decor to the last leg of your renovation journey. "It’s always advisable to let the larger picture take its stage before filling the gaps to enhance the overall look and feel." 3. Balance your desired themes/designs with practicality. "It’s good to keep an open mind and explore ideas and suggestions provided by your ID and contractor. In our case, our contractor has been so kind to provide us advice and present to us the pros and cons of certain design we wanted to stick to at the start." Paul and Gloria say, "We love how personalised our house is as it is truly one of a kind—unique and uncommon from most HDB themes. We love the homely, old-fashioned, and cosy theme [that makes us] relax completely once we step in. We are amazed at how our desired dream house has materialised to what we have today, and we are proud owners of our self-designed country home!" We'd love to feature your lovely home. Email us at hello@cromly.com. Looking for more French-inspired interiors in Singapore? Go here. You can also go to our Inspiration page for more photos.